The consumerization of IT is coming. It's a given that employees will bring their own smartphones and tablets to work or will want to work on these devices away from the office. Mass adoption of smartphones and tablets has set expectations, causing the "I want my iPad" phenomenon in the workplace. Bring Your Own Device (BYOD) mobility programs bring new challenges to protect company data through simple, easy-to-manage, secure mobility solutions. But BYOD is not just a technology issue; it demands an effective approach encompassing business strategy, policies, and systems. 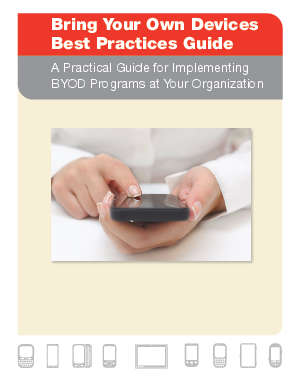 This practical guide provides best practices for implementing a BYOD program.